Voters are suspicious of new Tory policies and mistrust the party's motives, potential leadership hopeful Andrew Lansley has said in a speech. The party must try to rebuild public trust and will only succeed if the party is seen as united, tolerant, compassionate and honest. 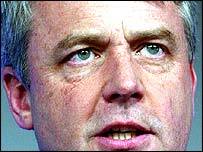 Mr Lansley's speech will be seen as his bid to enter an already crowded race to succeed party leader Michael Howard. This week Ken Clarke indicated he might also run for Conservative leader. David Davis, Sir Malcolm Rifkind and David Cameron are just some of the other people expected to enter the contest. Health spokesman and MP for South Cambridgeshire, Mr Lansley set out his stall saying: "It is not enough simply to have lots of new policies in different areas - school choices, freedom for hospitals and so on. "The problem was that the public suspected our motives because they did not understand our vision." He gave the example of Tory plans at the election for greater choice for parents when it came to schools arguing that it was wrongly perceived as "some Conservative obsession with markets, efficiency and productivity". The answer, he claimed, is to project a "positive" Tory vision for education. And he said the party has to bring forward a new generation and new representatives. "Only by our actions will we win back trust. And it can only be earned if we are, and are seen to have integrity, to be honest, compassionate, tolerant, generous, realistic, competent, united and loyal to each other." On Sunday ex-chancellor Mr Clarke said he would run for the Conservative leadership if he thought he could win and the party was ready to change to broaden its appeal. The 64-year-old ex-chancellor also said he was not too old to become premier. "I have a habit of running for the leadership, which means I think my friends know perfectly well I would like to be prime minister," Mr Clarke said. Shadow transport secretary Alan Duncan, also seen as potential candidate, said on Sunday there was "massive feeling" among Conservative MPs that the leadership contest should happen soon, rather than towards the end of the year. Mr Duncan described Mr Clarke as "a bit of a latecomer", and said: "It is clearly mainly now a fight between David Davis and David Cameron."